With Valentine’s Day just passed, I thought it would be appropriate to post something sweet…literally! I found this photograph while browsing Etsy, which I may or may not be addicted to. For those of you not familiar with the site, it’s basically an EBay for handmade-only or vintage arts and crafts. It’s a great start for photographers who want to get their work out there. All you have to do is have inventory and set up your store, for a small fee of course. In this photograph, Maile Lani is actually advertising her TTV (through the viewfinder) Valentine’s Day cards and while it does do the job beautifully, I actually like this as a photograph. There is something about this picture that speaks to me, I’m not sure what it is, but I adore it. I like the simplicity and sweetness of it. I think her cards and photographs are a great grown-up twist on the classic conversations hearts, which may not be the tastiest Valentine’s Day present, but this photograph sure is delish! To me, there is something special about simple photographs. It takes a lot of creativity and talent to turn something ordinary into a beautiful work of art. My best work has been when I just went out and took photographs without anything particular in mind. When you are relaxed and carefree, your pictures can be reflect the same, just as you can see emotions in paintings. Sometimes there are soft, wistful strokes, and other times jagged, rough ones. I paint in my free time and trust me, you can tell. Photography is an art and art is a way to express your emotions. If you seem to have a block and your photographs just aren’t turning out right, maybe you just need to stop, breathe and take a look around. There are probably amazing opportunities right in your own backyard. 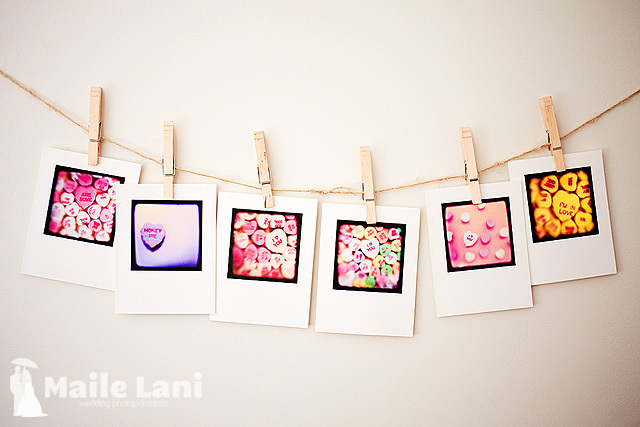 Maybe this Valentine’s Day you can relax with your special someone and take some sweet photographs yourself! Photograph courtesy of Maile Lani Fine Art Photography, http://www.etsy.com/shop/mailelani.